[3 minute read] Our 2018-2019 calendar emphasizes developing an understanding & responding to the context of your classroom. We start with an inspirational quote, back it up with research, then provide you with classroom application ideas. Our November 2018 blog post, written by Instructional Designer Michelle Escudier, takes a deeper dive into identifying your implicit bias. Unconscious, implicit bias, may be more prevalent in our college classrooms than college faculty perceive. Exploration of implicit bias in our classrooms enables educators to take steps forward in creating a culturally responsive classroom where learning occurs for all students. Let’s say I have a computer science student, Lulu, who is an undereducated, middle-aged, and from a middle-eastern culture. Lulu’s work history is non-existent, and this is her first venture into community college. She has stayed at home raising her four children. A negative implicit bias I might have could be against stay-at-home moms, or women from the Middle East, or middle-aged persons entering college. I, as an instructor, unconsciously assume that Lulu is not as capable of learning code and that she would not fit into our interactive, tech-dominated classroom culture. Consequently, my enthusiasm for working with Lulu is lacking – and it shows. Culturally Responsive Teaching (CRT) calls us to consider, celebrate, and use the cultures that our students come from to make an inclusive classroom where learning is driven by an understanding of our students’ cultures. 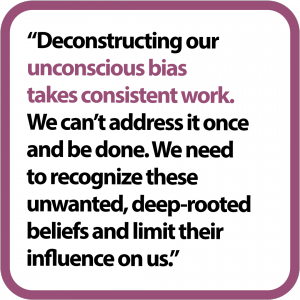 Implicit bias informs my behavior and prevents me from working with Lulu on a deeper level. By examining my own biases and learning about her culture and background, I can learn more about her needs as a student and accelerate her success in my classroom. Increase awareness of your own bias: Take the Project Implicit bias test. This test, sponsored by Harvard, enables users to explore their feelings of bias against people of different cultures, races, genders, and age groups. Name it where you see it: Join colleagues in examining bias by discussing what goes on in your classrooms. These collaborative efforts can go all the way from informal faculty chats to departmental initiatives. Be willing to be open and honest and agree to “name it where you see it.” An online Facebook group has been created specifically for this purpose. Join CRTxACC. Collect Data: What are the patterns of success and failure in your own students? Do non-native English speakers have trouble following your instructions? Are students working alone when they would rather be collaborating? Are students not participating in your classroom discussions because of the way they are structured? Anticipate bias: Create systems in your classroom to reduce bias. Use rubrics or other grading systems to help eliminate grading bias. What are your classroom discipline procedures? Are they designed to be distributed equitably? Build empathy by getting to know your students: Find out what you have in common with your students by taking Panormead.com survey with them or designing your own survey. While “Thirty-four percent of undergraduates reported perceiving themselves as a target of subtle bias” (Boysen, 2009), this doesn’t have to be a number we accept. As educators, we can take steps in our classroom to recognize implicit bias to build a better learning environment for all students. To support faculty who are exploring and implementing culturally responsive teaching in their courses, we’ve created a Private Facebook Group to facilitate collegial conversations. CRTxACC members are encouraged to share resources, experiences, and questions to deepen their understanding of culturally responsive teaching. Get to know your students from day one with a 15 minutes survey, instant feedback and explore similarities between you and your students. 4 Responses to "5 Ways to Challenge Your Implicit Bias (November 2018 CRT)"
Half of the puzzle though is to examine it from the perspective of the teacher as well. Feelings are valid and to be counted, but hard evidence and explanations can be just as valid. Sometimes the perception of subtle bias is wrong and sometimes it is not. If every perceptions is accepted as fact we are in a state of falsity that can be dangerous to a society. There are stages of gray and various cultures and ages deal with things differently. Giving people the “benefit of the doubt” is often the best way to live in trying to decipher perceptions of treatment to us. However, to be clear, I am not a fan and a huge critic of some white cultures “Let’s not go into that unpleasantness”, which often covers overt racism. Thank you for speaking about an important topic. Thanks for your comment, Laura! A helpful way to think about whether the bias was intended/unintended or rightly/wrongly assumed is to consider both the intention and the impact of whatever happened. A teacher may not intend to offend or exclude someone, however, if the student raises the issue, it’s important that the teacher takes responsibility for their impact on the feelings of that student and reflect on how to change their behavior in the future. Hi Again, I dislike the notion that there is always a right and wrong side in every situation. It is a complex and fascinating issue and current trends going back 20 years or so does lean toward interpreting the conflict as a mistake or bias when it occurs by the teacher, but it may not be, that’s all I am saying. Therefore ” reflect on how to change their behavior in the future.” while valid most of the time, there are times when it is not valid. Talking and sharing more is the only way to continue to work through these interesting, challenging situations. Thank you for this. I am loving this series on CRT! Your are doing a great job enhancing faculty awareness. I think if students are also made aware of implicit bias in faculty and have some knowledge and language to address it, they can hold faculty accountable. While our audience is more diverse than just faculty, we (the Peace & Conflict Studies Center) are posting this on our social media as well.